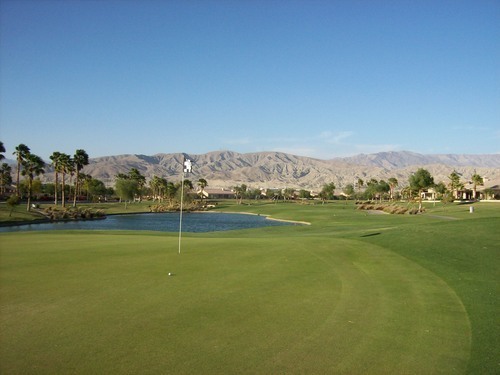 I’ve spent plenty of time playing golf in the Coachella Valley in the past year, but there are so many courses out there. I still have a pretty good-sized list of courses yet to play (and that’s not counting the many, many private clubs I’ll probably never get access to). 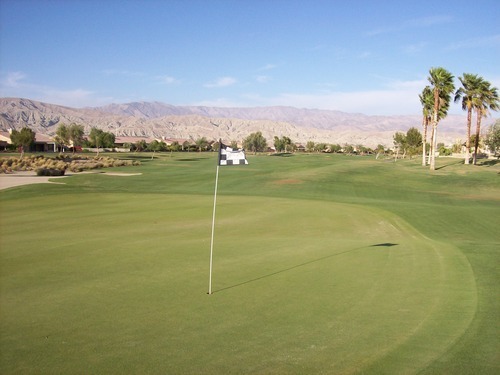 Even though we’re at the tail-end of the peak season in the desert and prices are still high at most courses, there are still decent deals to be found—enough to prompt me to take another little overnight trip up there Friday and Saturday. I had a 2:07 tee time, but ended up teeing off right about 2:00 as they paired me with another twosome. It was pretty busy out there and we waited a little bit on most shots, but the pace was solid at just over four hours. I bought the tee time through ezlinks.com at a rate of $42, and it was definitely worth that price. 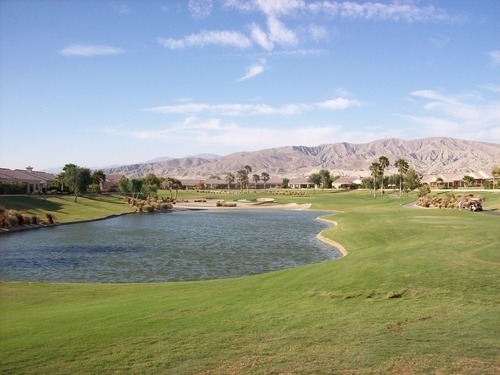 However, most of the online times I’ve been seeing out at Shadow Hills lately have been $85-plus. In my opinion, it’s not worth those kinds of prices right now. 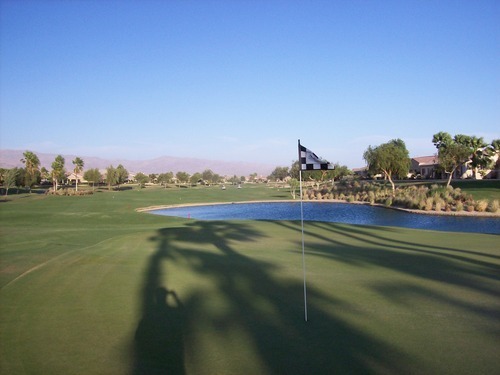 It’s a solid course all around, but there are many other better Coachella Valley options in the same mid-level price range. 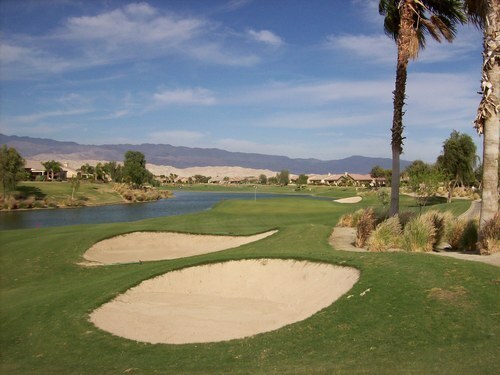 That said, Shadow Hills is a fine course with plenty to enjoy. 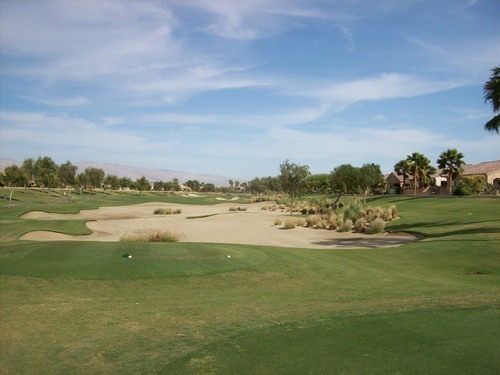 Like many Palm Springs area courses, the layout is pretty forgiving off the tee as long as you can avoid the sand traps. There are many bunkers out here and with all sorts of funky sizes and shapes, they can be penalizing if you find them. However, there’s enough bail-out room throughout the course that they can be avoided with smart shots. 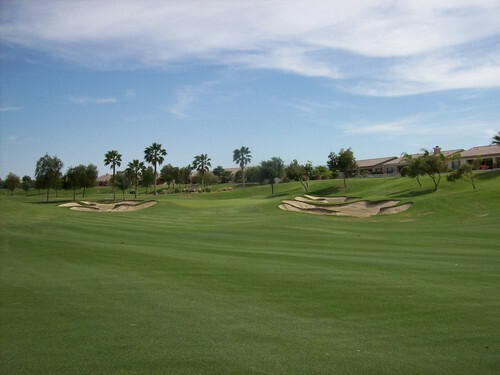 The fairways are pretty wide, the rough doesn’t present much challenge and the greens are very large with a lot of undulation. I found the bunkering and greens to be the most interesting design aspects of the course. 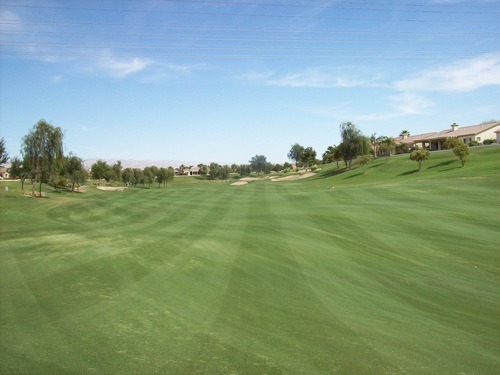 There aren’t too many trees in play here, and though the course winds through a residential neighborhood, you’d really have to spray your shots to find the houses or any OB areas. 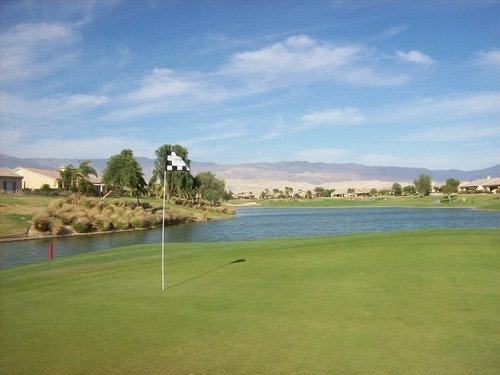 There is plenty of water on the course, too. 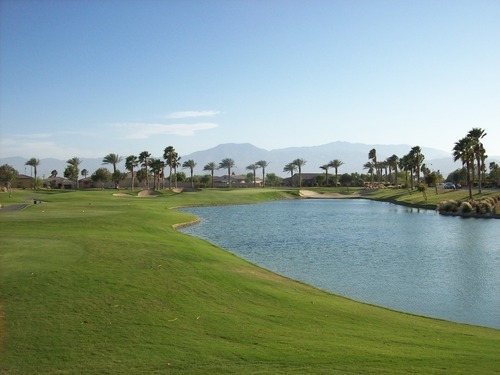 On the front nine, it seemed the water was more for decoration and to force a few small forced carries off the tee boxes. The 9th hole is where it comes into play the most, affecting both your tee shot and your approach on a long and tough par-4. The front nine is pretty forgiving, but the back nine definitely gets tougher. 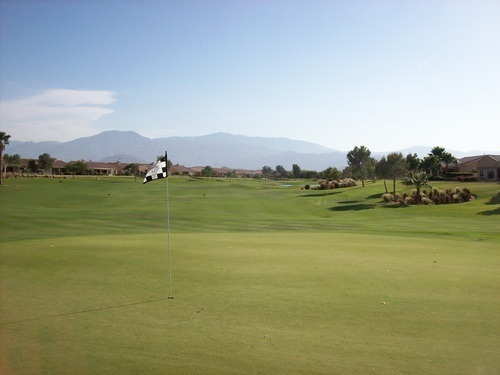 It plays a few hundred yards longer and the holes are more interesting. Water definitely comes into play more. 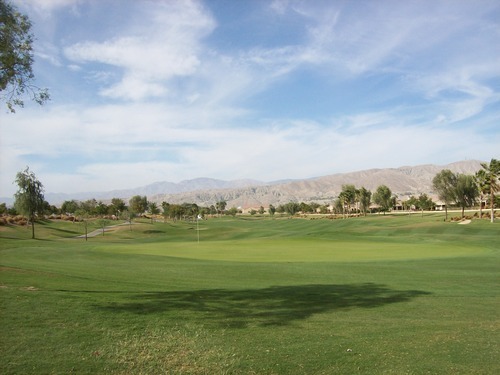 Nothing impacts the challenge of Shadow Hills, though, than the wind which is often prevalent here. 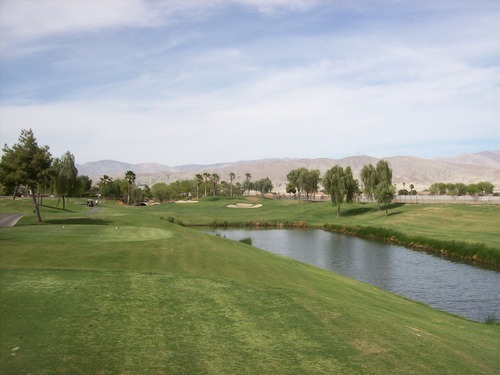 I’ve played most of the courses on the north side of the I-10. There are a lot of great layouts on this side of the freeway, but the downside is that the wind in this part of the valley can be brutal at times. The funny thing is I’ve never gotten a really windy day in any of my “northside” rounds. Well, Friday made up for that with a vengeance! The wind was blowing pretty good during the front nine, but it wasn’t bad. By the time we made the turn, it was beginning to howl and it only got more violent as the afternoon went on. It’s disorienting as you are standing over shots and desert dust will fly in your face with big gusts, making it unpleasant to say the least. 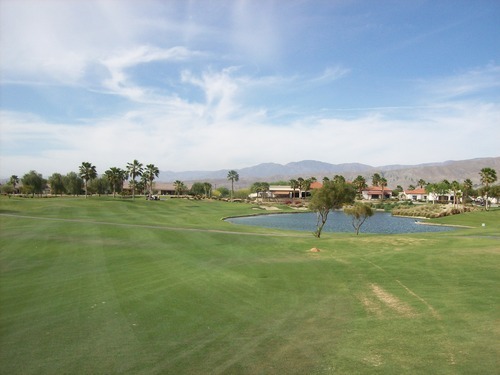 On top of that, the second half of the back nine at Shadow Hills (which are already the longest and toughest holes on the course) plays right into the teeth of the wind. We also had the sun going down over hazy skies, so it was an exhausting way to finish the round. Yet, it added some fun and excitement that made the overall experience a bit more memorable for me. The service was pretty scaled down that late in the afternoon, but they do have ice chests full of water bottles by the club house and you can load up on as much water as you want before the round and at the turn. That’s always appreciated here in the desert. The starters were both very nice and fun to talk to as I waited my turn by the first tee. 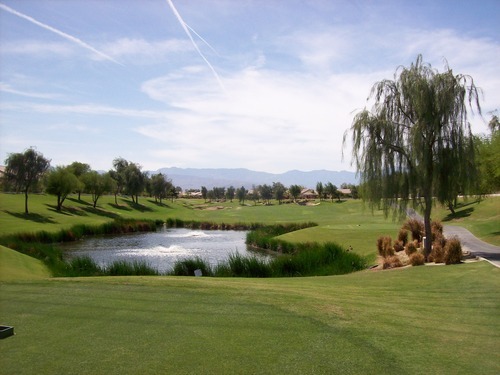 The course gets a lot of play from regulars who live in the Shadow Hills community, so it’s more of a country club vibe there. 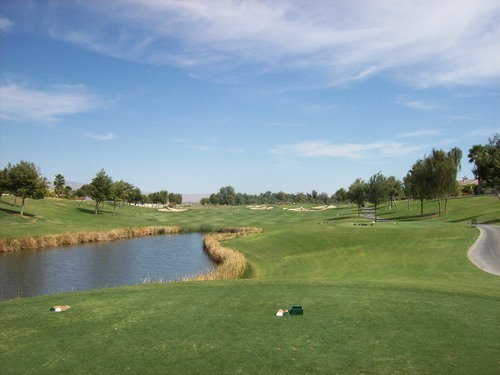 The conditions were good overall at Shadow Hills. 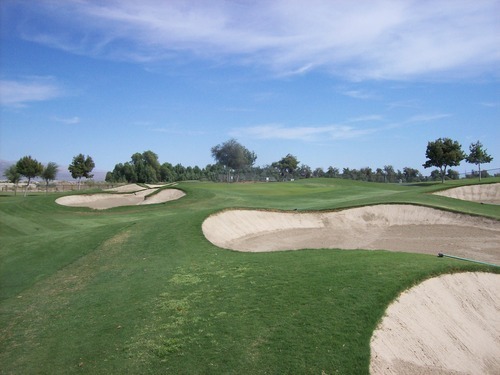 If compared to most other Southern California courses, I would say conditions here were “excellent.” But by Coachella Valley standards this time of year, I would say they were just so-so. 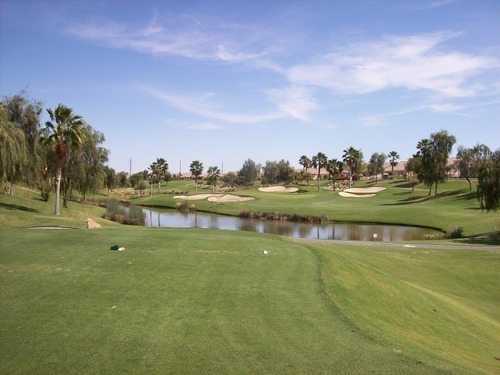 The fairways were very nice. They were mostly quite lush, green and great to hit off of, but with some thin/brown patches scattered throughout, too. The rough was just in okay shape I thought. It was cut down a lot, so it was not too penal. The tee boxes were great and the bunkers were nice. The greens had a thin top coat of sand, making them a little bumpy here and there, but not terrible. 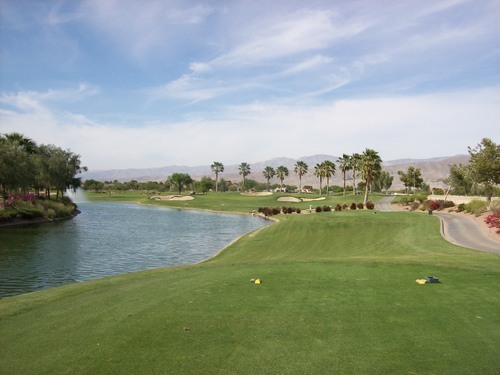 One thing I did like about them was how much bite you could get on chips and wedge shots, so it was fun to be aggressive. The greens are very large here and some of the back pins were tucked in very tough places, so it helped to be able to fly it up to the right level and make it stick quickly. 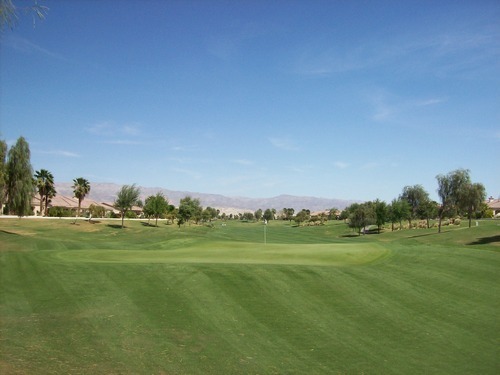 For the right price (I’d say under $65), I would gladly recommend Shadow Hills. It’s solid on all levels, but not worth breaking the bank to play. Personally speaking, I’m more likely to come back and play the par-3 North course than I am the South, though.